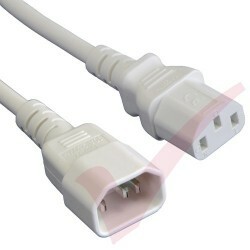 C13 - C14 IEC 60320 Power Jumper Cables There are 50 products. C14 Male connector - Female C13 IEC60320 data centre grade extension power leads to fit PDU, UPS and other active network equipment. Different coloured cords allow for clear identification in server racks. 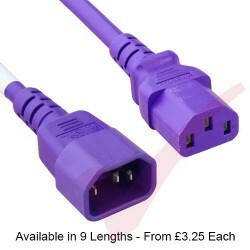 Premium SJT jacketed PVC IEC60320 data centre grade extension power leads. C14 Male connector - Female C13 to fit PDU, UPS and other active network equipment. Different coloured cords allow clear identification in server racks. The Female C13 connectors simple locking mechanism, locks the IEC power lead into any standard C14 Male connector of a PDU, UPS or any other active networking device. 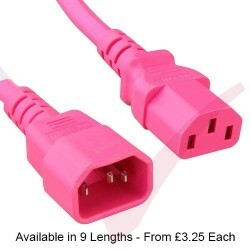 The Female C13 connectors simple locking plus mechanism, securley locks the IEC power lead into any standard C14 Male connector of a PDU, UPS or any other active networking device. 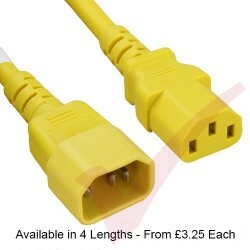 IEC C14-C13 splitter power extension leads, allow 2 devices to share 1 power outlet. Fully moulded cables with 2 Female IEC C13 Connectors leading to one IEC Male (C14) at the other. 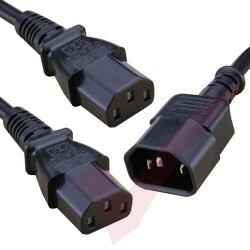 C13-C14 IEC Angled Cables are available with the C14 (Male), C13 (Female) or both connectors angled Left or Right for when space is at a premium. 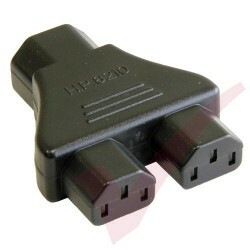 Suitable for UPS, PDU's, network switches and many other data network environments. 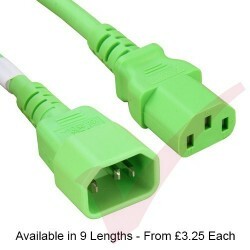 C14 (Male) & C13 (Female) secure sleeves help to prevent IEC320 power leads from accidently being disconnected.